This week I made a very special recipe for Otabé Kafe in Putney - Gluten free Brownies. I am very passionate about cooking gluten free recipes. It must have been now more than 10 years when my friend André started feeling awful stomache aches without understanding what could have been possibly causing such pain and disconfort. Many medical tests later, we discovered he had the Coeliac disease. No one knew much about this disease, only that it was cronical, and it was an intolerance to the gluten in wheat! Gluten is essentially what makes flour rise. It was a shock to then realise that nearly 80% of our diet had wheat! It became a very complicated task to shop for food. Ten years ago food didn't come packaged with information about gluten! Nowadays, and more and more people discovering they are wheat intolerant, it is now easier to make a healthier and more cheerful diet without it being such a stressful part of one's life. I made my mission ten years ago to learn to cook gluten free and it's something I am very passionate about. My gluten free brownies are so delicious I prefer them to my usual recipe with wheat flour! 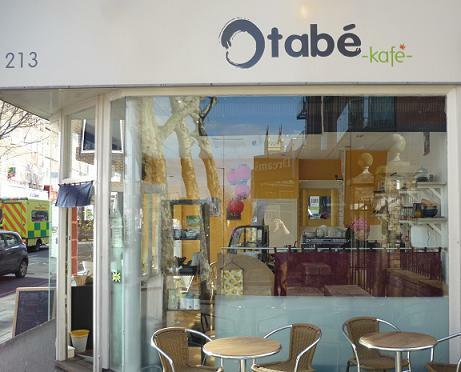 So go to Otabé kafe if you have the chance and let me know what you think!! This recipe will be improved - the sky is he limit! I am so excited!